The fruits of their collaboration is a 107,297 sq m, two-volume building just west of the Bank of England. It is super-sustainable, with a 98.5% BREEAM rating at design stage — the highest ever. Unlike much new development in the City this is no skyscraper, nor yet another icy block of sheer glass. Instead it is a stone framed groundscraper, nine storeys tall (excluding a shallow roof plant level) and split by a pedestrian arcade. Like Bloomberg himself, the new HQ presents a distinguished, dry, upbeat yet understated exterior. 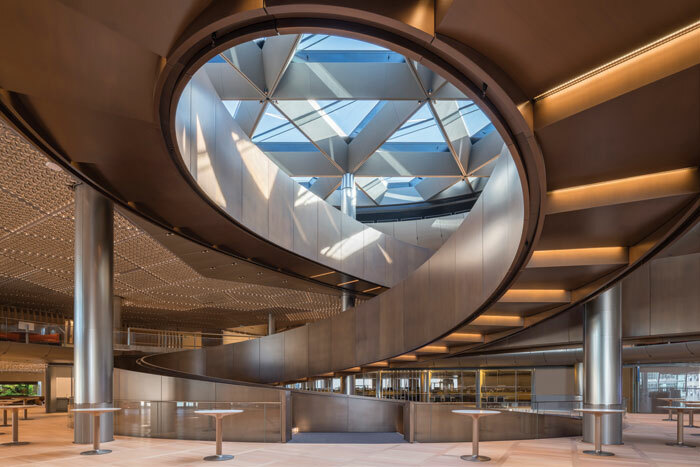 By contrast, the interior, which houses all 4,000 of Bloomberg’s London staff, is futuristic and glitzy, with dazzling high-performance ceilings and a dream-like spiral ramp that is the central element of the main volume. As Foster + Partners senior partner Michael Jones says, ‘Outside is dignified, inside is dynamic’. The HQ also hosts major permanent artworks inside and out, include a dedicated public art gallery and it restores a Roman temple in a state-of-the-art visitor centre, The Mithraeum. The whole project is reported to have cost £1bn. The Bloomberg HQ is the third comprehensive vision for the five-sided site since the Second World War, which had left it a field of rubble. 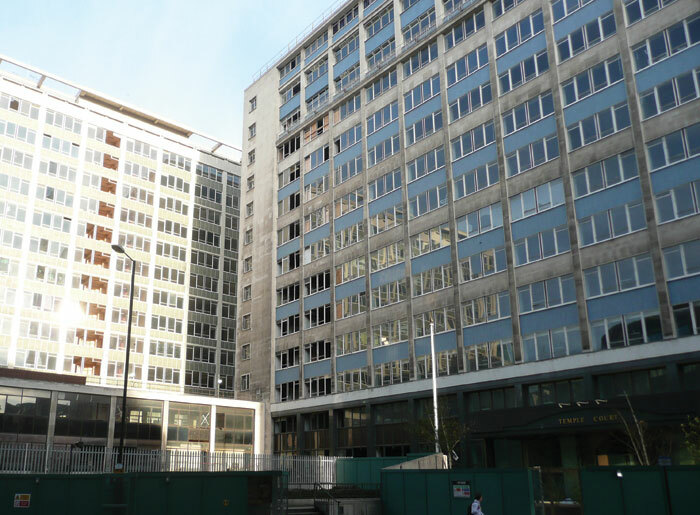 In 1954, when the London Building Act’s 30m height restriction on newbuild was lifted, the first block to break it was a 14-storey modernist slab with wings called Bucklersbury House, designed by Owen Campbell-Jones. Adjacent to it, a similar block, called Temple Court after the erstwhile Roman temple, swiftly followed. By 2004, the site owner Legal & General wanted to redevelop, and a second vision emerged, called Walbrook Square. Initially designed by Jean Nouvel, it included a 104m-high skyscraper called The Cloud, which was immediately nicknamed Darth Vader’s Helmet. An echo of its faceted glass skin can be seen in Nouvel’s nearby One New Change (2010), also known as the Stealth Bomber. Foster joined forces with Nouvel, then took over the scheme, which included a new restoration of the Temple of Mithras. Planning permission was granted in 2007. This was around the time that Bloomberg startied thinking about consolidating its London staff in one building, and Walbrook Square was looking for takers. When it consolidated in New York, Bloomberg had moved into a César Pelli-designed scheme with a 54-storey tower, but had to extensively adapt it to its needs. This time, Michael Bloomberg wanted more control over the design from the start. With Foster on board, the third vision for the site began to form, something which Bloomberg said ‘fits in with London…I wanted to respect London’s aesthetic traditions’. The Cloud was dropped in 2009. In 2010, Bloomberg acquired the site. Key to Michael Bloomberg’s agenda was sustainability, something that Foster has long pioneered. At the Commerzbank headquarters in Frankfurt in 1997 (which shares the claim for the first green skyscraper with Christoph Ingenhoven’s RWE tower in Essen), he was at the forefront of a design revolution of naturally ventilated internal environments that save energy and made offices healthier. Two decades later, this is a key feature defining the Bloomberg building. As Foster says: ‘The whole issue of the wellbeing of the Bloomberg community [is] related to fresh air. That air moves, and it moves the same way as people move on the spiral ramp — towards the light’. 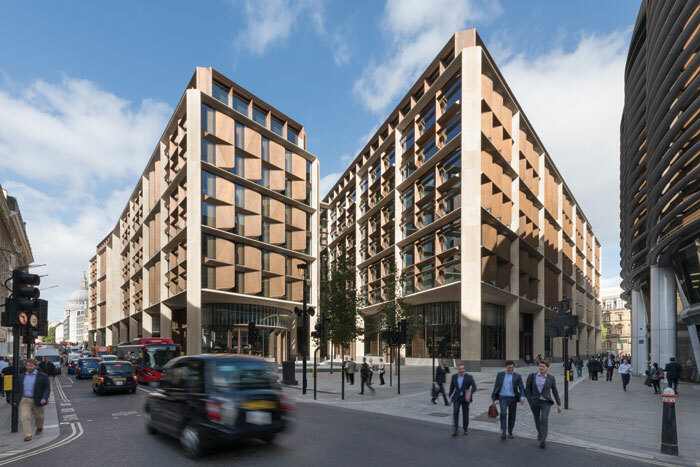 Foster describes the exterior walls as ‘breathable’, although a more accurate description would be ‘breathing’, and they are one of several sustainability innovations at Bloomberg. 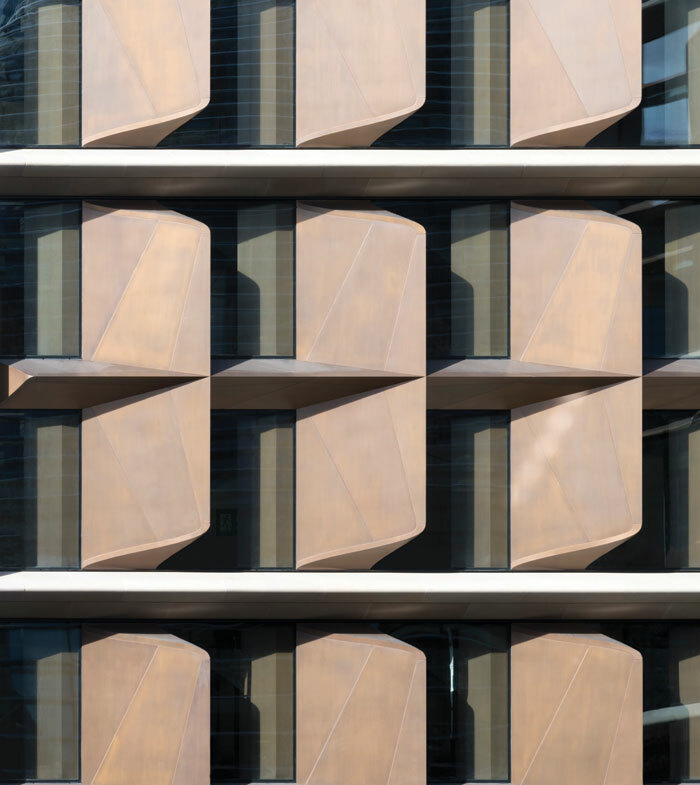 An exoskeleton of Derbyshire sandstone (9,600 tonnes of it) around the buildings forms two-storey rectangular apertures in the six middle storeys, and within these are mounted 250 hand-patinated vertical blades cast from 600 tonnes of Japanese bronze. Among them, 117 are what Foster refers to as ‘the gills’ of the building — vents that interface between the exterior and interior. Their lining also attenuates the sound of the City, although that is anticipated to decline — as Jones says, ‘We see electric and low-emission vehicles, and they’re quiet’. Further energy savings on internal climate control are made by a system of CO2 monitors that detect occupancy levels and adjust air flows accordingly. Glass lifts by Kone are sited around the perimeter of the floors, set in bays and cantilevered into the open air from the internal facade. Their mechanics are concealed beneath rather than being visible above, and a test tower was built especially for them in Helsinki. But the heart of the main building offers a very different sort of vertical passage. The volume containing two-thirds of the floor area lies on the northern side of the covered Bloomberg Arcade. This effectively extends Watling Street, once a pre-historic trackway from Kent to Wales which in the City had been reduced to a mere 200m stretch from St Paul’s. 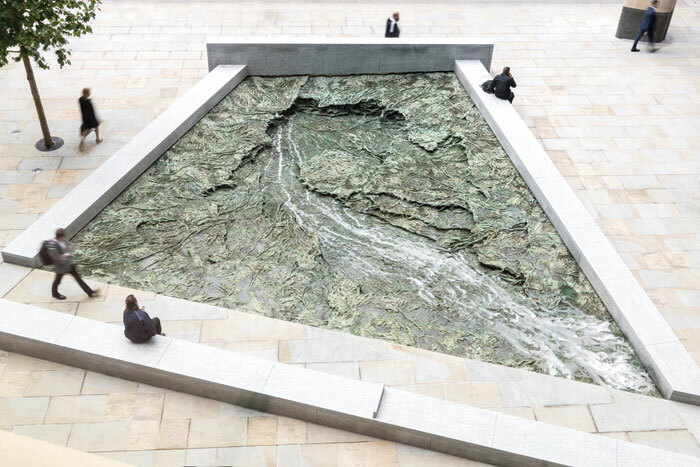 At either end, in new public plazas around Bloomberg, are Forgotten Streams, artworks by Cristina Iglesias which reference the Walbrook, a river which originally ran through the site but was covered over in 1440. As at the Centro Botín, Santander, she characteristically crafts water trickling over dense, organic metal forms — up close, you can hear the water, and the effect is calming. 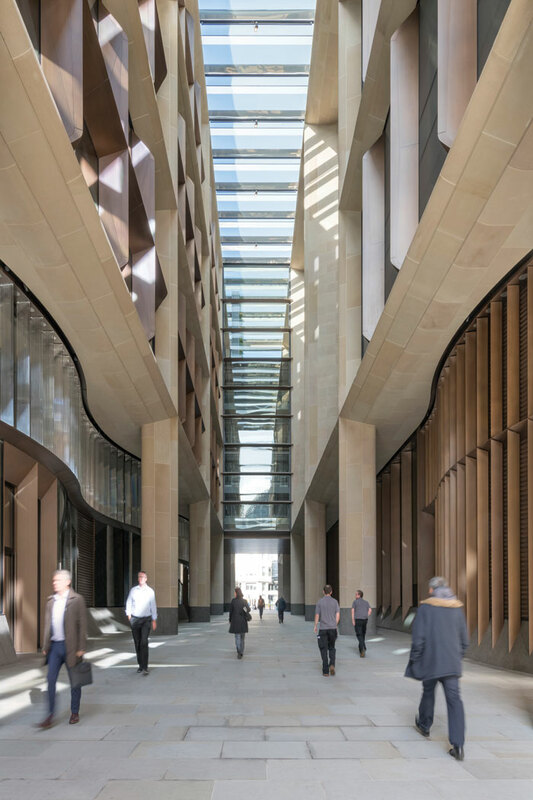 The main entrance is at Bloomberg’s northern corner, opposite Mansion House, and is entered through an extraordinarily shaped lobby called The Vortex. It is bounded by curved shells of American red oak that lean in towards the ceiling, a curve-edged triangle of reflective stainless-steel artwork across which fingers of darkness spread. It is at a height where sea-level could rise to in a worst-case climate change scenario. This is another artwork with a watery connection. It is called No future is possible without a past, and is by Olafur Eliasson, known in London particularly for his vast sun in the Tate Modern Turbine Hall installation The Weather Project (2003). Eliasson says that one narrative he offers to those converging here for work is that ‘you are entering the building submerged, you look at yourself in the mirror, liquified’. To one side of the lobby, a circular ante-space is lined with 40m of abstract tapestry, a work by Pae White of cashmere, metal threads and cotton, called Pomona. It leads to a 250- capacity auditorium, with walls padded in Worcester fabric. Straight ahead from the lobby, we enter the main central space, which is something of a vortex itself. In this full-height atrium flows not just air towards the distant skylight, but also a spiralling, bronze-encased walkway suspended in space, which turns, crosses and touches the office floors as if in a dance. Its continuous 200m-long path is a hybrid of stair and ramp, following a shape called a hypotrochoid — a shape traced by a point on a circle rolling within a larger circle, like an old Spirograph drawing. Here, it is an outer ellipse rather than a circle, defined within the atrium void to touch the curving inner edges of the office floor plates. The ramp turns back inwards three times in a complete revolution. Jones reports that a mathematician was brought in to tackle the geometry. The ramp is stunning, and is intended to encourage impromptu encounters among those walking on it. What dazzles you as you walk the ramp and out on to the open floors are the vast expanses of glittering ceilings — actually diamond-shaped panels each containing a field of folded metal petals and LEDs. This is another technological innovation — each of the 2.5 million petals is multifunctional. Chilled from water above, they act as chilled beams. They are also acoustic baffles, and scatter light to make the building’s 500,000 LEDs appear twinkly (and save 40% of the energy of neon). Their inspiration is the tin ceilings of New York, intricate pressed surfaces that spread in the 19th century as an alternative to fancy stucco plasterwork. Beneath them the floors are open right to the building perimeter, with few walls — as Bloomberg commented, ‘the fewer walls there are, the more people come together to share ideas’. What walls there are carry large and typically bold artwork graphics by Michael Craig-Martin, which have a way-finding function — with all the turning and dazzle, it’s easy to imagine losing your place in the sea of desks. If the giant graphics weren’t enough, a desk-locating app is available. As Murphy says, it’s ‘all about moving freely through the floor plate’. Foster-designed desks cluster across the floor plates with hexagonal partitioning. In all, this Bloomberg HQ has 6,700 workstations. They stand on wooden floors, from which magnetically secured planks can be lifted to provide cable access. The third floor contains studios for Bloomberg TV. The sixth floor hosts a spectacular double-height meeting-and-eating zone called The Pantry (the food is free), with snaking sofas and benches. Light falls through the triangular lattice of the hexagonal skylight above the atrium void, but the roof also collects rainwater. Overall, water conservation saves almost three-quarters of the water used in an equivalent conventional building. How does the Bloomberg HQ fit into the urban narrative of the City of London? Clearly it represents an alternative to the skyscraper cluster to the east, which is being overwhelmed by emerging glazed behemoths, such as Allies and Morrison’s 100 Bishopsgate and PLP’s Twentytwo. Nearer to St Paul’s, development has long been lower, with just two blocks reaching 100m and OMA’s New Court (2011) for Rothschild reaching 75m. (Mies van der Rohe’s unbuilt bronze-glassed Mansion House Square tower immediately across Queen Victoria Street from Bloomberg, would have reached 88m.) 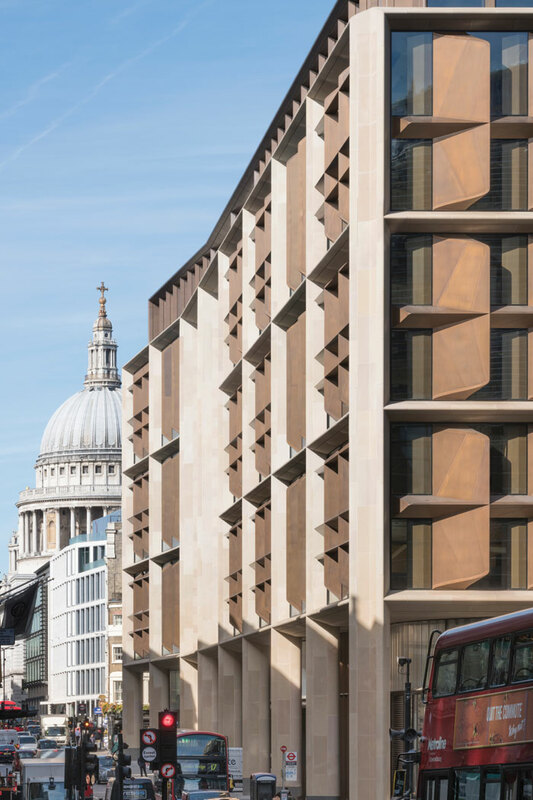 Bloomberg’s immediate neighbours include exceptional commercial architecture free of vast tracts of glass, such as James Stirling’s No 1 Poultry (1990), Foster’s The Walbrook (2010) and, just to the west, Whinney, Son & Austen Hall’s 30 Cannon Street (1977). None express themselves with height, and Bloomberg reaches just 40m. This doesn’t spell the end of skyscrapers or ‘Big Glass’ in London, but it reminds us that cities can be powerhouses without either, as the emerging world cities of Lisbon or Berlin are. The bigger issue is sustainability. With energy savings of more than a third and all its green technical wizardry, the Bloomberg HQ should drag sustainability back to the top of the agenda in commercial architecture. It needs to be there, not least because global financial cities are among the most vulnerable to sea-level rise, as Eliasson reminds us. Bloomberg occupies a site of warriors. Roman soldiers honoured Mithras here, and Darth Vader almost made an appearance. Now, a new warrior is alive and breathing through the very walls of the new headquarters — it is the climate warrior. You enter a dark space. A horn calls, voices are speaking Latin, chanting begins — the sounds of a secretive meeting of one of the most mysterious cults of the Roman Empire. From the misty air, the form of a temple takes shape, marked in stones beneath you. All this is conjured up in the public visitor centre London Mithraeum, situated below the new Bloomberg European headquarters. The Temple of Mithras is recreated with light, sound and authentic materials — amid the ruins themselves. The Bloomberg site has history — two millennia of it. In 1954, archeologists had found traces of a Roman building there, but what was it? 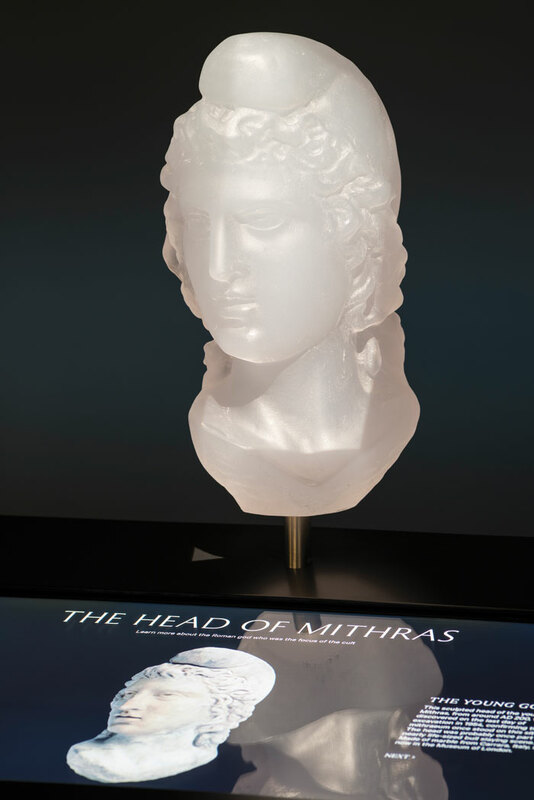 On the last day of a dig before construction works were to begin for Bucklersbury House (see main story), archeologists unearthed the key to what they had found — a head of the Roman god Mithras. An all-male cult of Mithras, popular with soldiers and merchants, had developed across the Roman Empire, and around 240 AD it built a temple to the deity on this site. When revealed in 1954, 30,000 people a day queued to see the temple remains. Building around them would have added £500,000 to the construction costs of Bucklersbury House, so they were reassembled in 1962 out in the open over a car park, 100m from their original position. 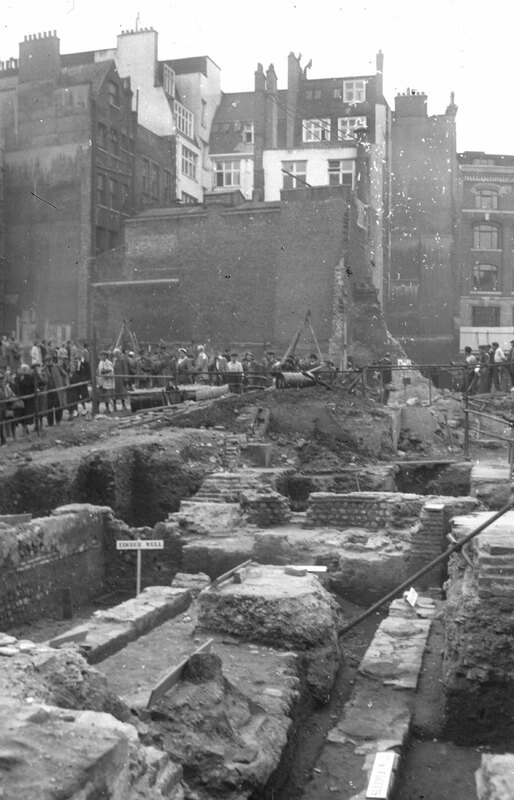 In 2010, the Museum of London Archeology (MOLA) led the second wave of excavation, recovering a treasure trove of Roman Londinium — 14,000 items from a wax tablet recording the oldest known British financial transaction to fist and phallus good-luck charms, but also including a 1950s’ builder’s pick. MOLA went on to supervise the reconstruction of the remains of the 18m-long temple in its original position, using Kentish ragstone to match the original stones, and materials as authentic as possible for the dirt floor. The design of the visitor centre around it, the Mithraeum, was led by Local Projects working with Studio Joseph, both New York based. At ground level, the Mithraeum shares its entrance with the Bloomberg SPACE, a venue for contemporary art. A bespoke vitrine displays 600 of the artefacts found. 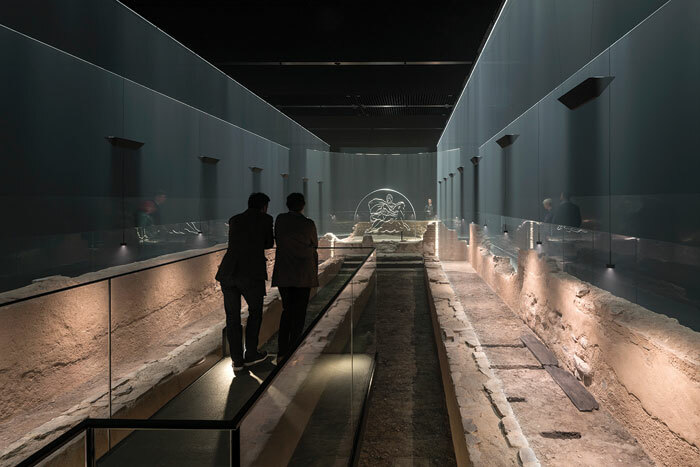 Stairs descend to a room of projections and touchscreen interactive displays about Mithras and Roman London. The temple itself is on the second basement level, at a depth of 7m, exactly where it would have been beside the lost River Walbrook. The chamber housing the temple offers a very contemporary visitor experience. Starting in darkness, sequenced sound and light gradually reveal not just the temple remains below the surrounding walkway, but its form and something of its atmosphere. The sounds you hear as it gets underway are uncanny, as if the spirits of Romans were haunting the place. The air is misty enough so that the temple volume is defined by downward sheets of light, and columns are brilliantly evoked by the shadows of suspended plates cutting them. These are the only columns in the Mithraeum, although two supporting the Bloomberg building above are in a wall, which separates it from the offices’ vast underground bicycle-parking facilities. Multimedia recreations of the past have been trending for some time, and some visitor centres such as the International Centre for Cave Art at Lascaux, France, designed by Snøhetta and Casson Mann even create alternatives to the historical attraction, physically distanced from it. Not so with the Mithraeum. Under the Bloomberg building, you are immersed in the cult of Mithras precisely where it was celebrated.